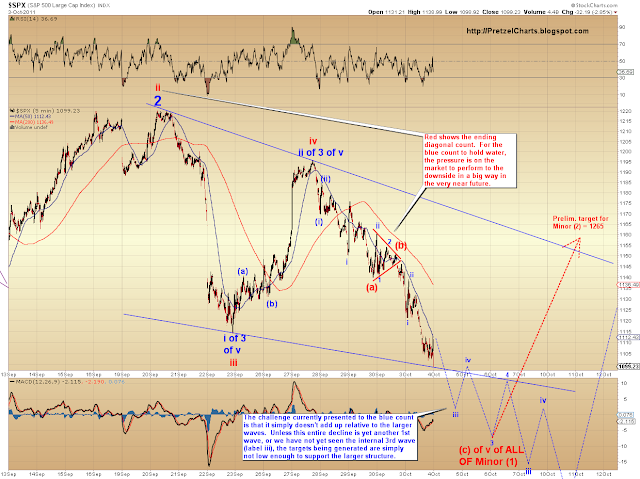 Pretzel Logic's Market Charts and Analysis: SPX Update: 10-3-11; Bottom in Sight? 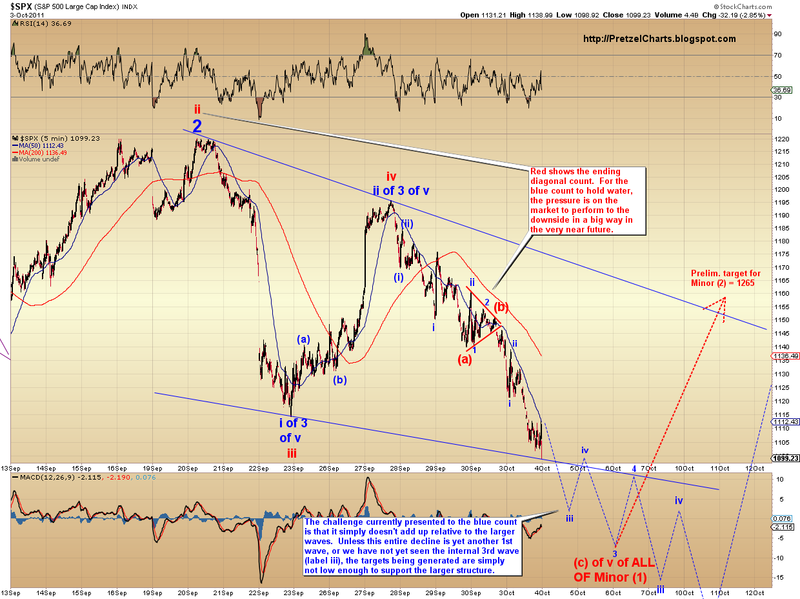 SPX Update: 10-3-11; Bottom in Sight? 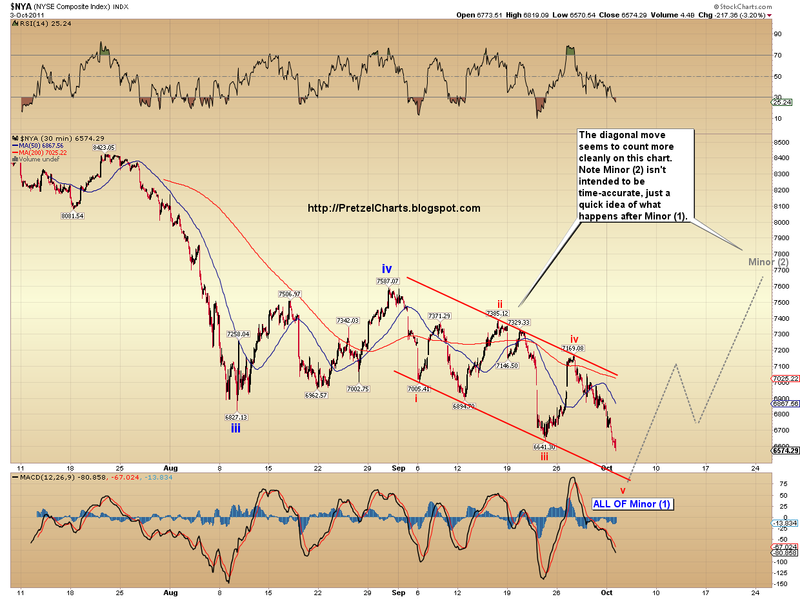 With the new low today, the market has finally fulfilled the move we've been expecting since early August. We now have confirmation that a new bear market is in place -- although this has been my opinion all along. It is important to be aware that wave v of Minor (1) has now fulfilled its minimum requirements, and as such, could end at any time. 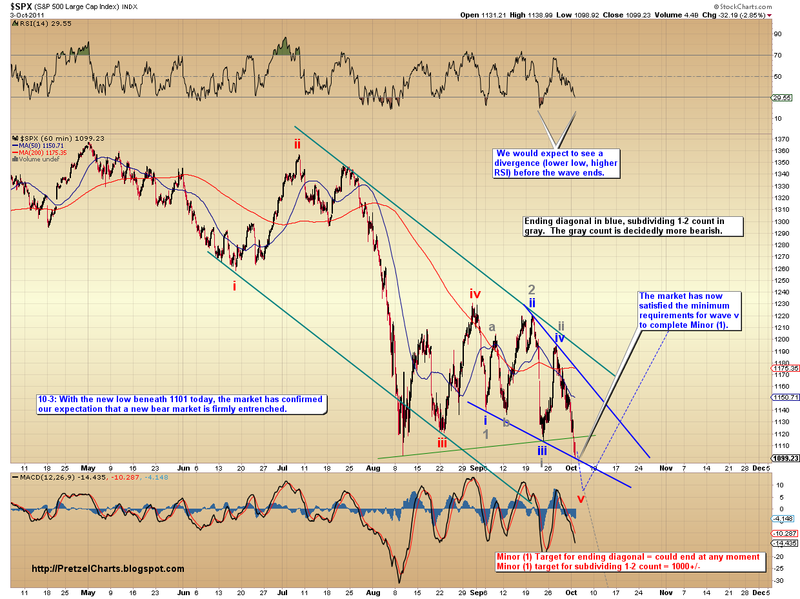 Again, I am expecting a sizeable rally off the Minor (1) low. The market performed almost exactly as my chart last night had it drawn. One thing we know with near certainty is that there is now a large rally waiting in the wings. However, at the moment it is a challenge to decipher the market's short term intentions. In examining charts, one often finds many garbled patterns adjoining one or two clear patterns. I call the clear patterns "triangulation waves" as they grant one the clarity to decipher the garbled patterns and fit the whole structure together. While I've had great success predicting the short-term moves over the last month, this market has not had a clear large triangulation wave in a while. This lack of a larger wave to triangulate makes prediction difficult when the short term waves also get fuzzy. The key thing to watch for as we approach new lows is a false breakdown of the diagonal; this is a usual function of ending diagonals, and it's designed to get a lot of participants on the wrong side of the trade. If the market breaks down from the diagonal, then proceeds to whipsaw and rally back up into the diagonal, expect that the bottom is probably in. If the market is oblivious to the ending diagonal, and the blue 1-2 count is playing out instead, the burden is on the market to prove that to us. It needs to continue moving strongly downward, much like it did today. So while today's action has actually clarified the big picture by finally showing us the complete impulse we've been waiting for, due to the short term wave structures, the immediate future has gotten temporarily hazy. Usually when this happens, the market tips its hand within a day or two and clarifies the shorter time frames. My best guesses are posted on the first chart below. Sometimes my best guesses are pretty darn good, but I always prefer to err on the side of caution. 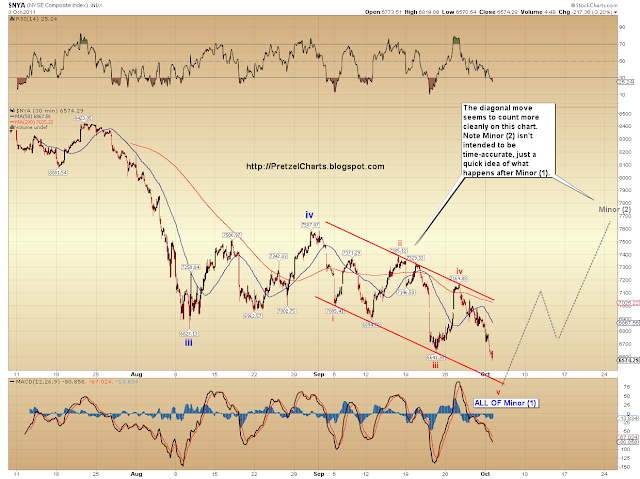 This first chart shows my best guess for the near future. If this is an ending diagonal, it is very close to completion (red line). If this is a nested 1-2 series, we still have a ways to go (blue). Thanks, Pretzel for your impressive work. The downside target for the first two charts, before the rally, is 1000? The downside target for that alternate count on your 3rd chart is what? The blue 1-2 count has an initial downside target of 1000. The ending diagonal could end at any time. We may have just seen the completion of Minor (1) down. If so, a multi-month rally is starting right now.